Do I really need to worry about radon? That’s not to say that radon isn’t real, because it is. It’s also invisible, odorless and deadly. In fact, more people die from radon exposure than car crashes, accidental falls and house fires combined. My point is that if you did just a couple of things, you can rest assured that high radon levels are not, and will not be an issue in your home. Test to see if the radon levels in your home are high. Lower the levels if they are. Radon is a radioactive gas that is formed when uranium in the soil disintegrates. It gets drawn into the house because has a very slight vacuum. The vacuum is caused by a “stack effect”, where warm air rises to the top of the house. Radon breaks down (decays) and form “radon decay products” (RDP). As it decays from one form to another, Alpha rays are emitted. In that form, they cause damage to human and animals. But if you breath them into your lungs at just the right moment, it could damage the tender cells and start cancer cells. If asbestos and/or smoke gets in your lungs, it’s the same potential result, but when combined the result is pretty much a sure thing, lung cancer. Is there a safe level? No. But lower levels are a lot better. Why? Imagine playing darts while wearing a blindfold. (I don’t have to imagine. I’m the reason why Peter Liberko looks the way he does. Sorry, Pete.) If you had one dart, you probably couldn’t hit the bull’s eye. But if you had a thousand (or a million) darts, and 24 hours a day for several years, you might. Then again you might not hit the bull’s eve. That’s where statistics come in. Lets get to the point, what needs to be done to lower the levels? This part is easy, and not too pricy. A mitigating company (make sure they’re certified), drills a hole in your basement floor, and runs a pipe from the soil below (where the uranium is) through the roof, where won’t bother you any more. They use a small fan, about the size (and about as loud) as the fan in your laptop computer. The fan should be in the attic, in case the fan housing ever gets cracked. The cost goes from $1,000 to $4,000, usually around $1,500. A lot of people have a short (2-day) test when they buy the house, because the seller might be inclined to help cover the cost of mitigation. Having said that, a longer test will be more accurate, because there are more hours to sample. You can get a kit at the home center. Be sure to follow the instructions exactly or hire a home inspector to have the testing done for you. 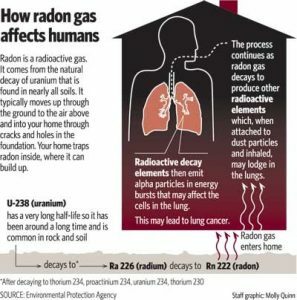 Further information about radon in the home is provided and can be found by Googling the EPA.